Before leaving Banff, we took an hour to soothe tired muscles at Banff’s Upper Hot Springs—just as visitors have done for more than 125 years. Water flows out of the mountain at 116 degrees F, but it’s cooled to 104 F, a tolerable and very therapeutic temperature. Lunch at a popular artisan bakery and deli fortified us for the drive to Lake Louise. Instead of driving on the Trans-Canada Highway, we took the slower but more scenic Bow Valley Parkway. Known as a wildlife corridor, the road also features numerous picnic spots, viewpoints, and hiking trails. But traveling at mid-day was not the best time to see wildlife. Along the way, we stopped at one of the most popular trails in Banff National Park, Johnston Canyon, which drops about 100 feet over a series of spectacular waterfalls. Catwalks and viewing platforms allow a unique variety of vantage points for scoping out the canyons and falls. Instead of just walking along the top of the canyon, there’s a platform at the bottom of the Lower Falls trail that allows you to see the Upper Falls (another mile, if you choose to walk there). We also stopped for incredible views of Castle Mountain and Tunnel Mountain and arrived at Lake Louise late afternoon. Our home for the next three nights was Post Hotel and Spa in the heart of Lake Louise Village, a tiny hamlet that has been developed to support visitors to the area. 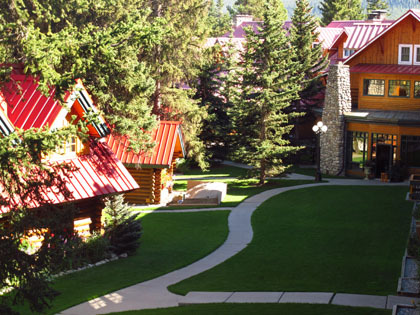 Built beside the picturesque Pipestone River in 1947, the Post Hotel was originally a ski lodge. But the influx of summer visitors necessitated renovations and additions. As a result of several upgrades and improvements, in 1990 the Post was accepted into the prestigious Relais & Chateau organization, a designation only achieved by the best quality independently owned hotels all over the world. We loved the Post (so-named because it once housed the local post office), perched in the midst of so much natural beauty. Our comfortable suite featured plenty of space to spread out--a sitting area, separate bedroom, large bath with Jacuzzi tub and separate shower, and a balcony overlooking the immaculately manicured grounds. Chairs on the lawn called for quiet reading or relaxing. Conveniently located, Samson Mall--where a smattering of gift shops and delis, a market, liquor store, restaurant, and bakery lined up in the only shopping spot in town--was just a quick walk over the bridge from the Post. Towards evening we drove about 10 minutes to Lake Louise for our first look at the quintessential Canadian mountain scene, familiar to any visitors searching postcard racks for the perfect "wish-you-were-here" picture to send friends and family. Known for sparkling blue water, Lake Louise is situated at the base of two mountains with Victoria Glacier smack-dab in the middle. The scene is even more amazing at sunrise, as we found out during our early-morning visit the next day. 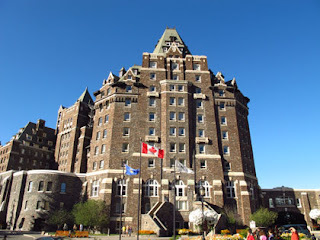 We didn’t stay at the Banff Springs Hotel, but that didn’t keep us from focusing our cameras on one of the grandest and most opulent hotels in the world. Whether looking across the Bow River at the hotel or strolling on the grounds, we found it to be a striking symbol of the elite gentry that first discovered this stunning mountain resort. To absorb the flavor even better, we spent an evening there, enjoying drinks on the outdoor terrace overlooking an oft-photographed scene of the river and its mountainous backdrop. William Van Horne was the entrepreneur who brought visitors to the Canadian Rockies. After a day packed with activity, we put on “nice” clothes and drove to this 20th century castle on Spray Avenue for a closer look at where today’s well-heeled tourists stay. 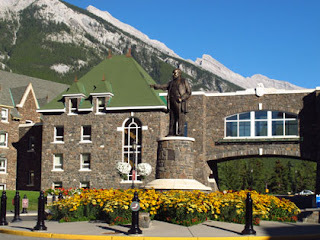 And it’s mighty impressive, starting with the central statue of William Van Horne, vice president of the Canadian Pacific Railway (CPR), who aimed to encourage train customers to visit the Canadian Rockies by building a series of luxurious hotels in mountain destinations of Canada. Banff Springs Hotel, the largest of these accommodations opened in 1888. 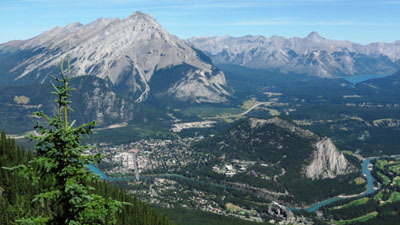 It was built close to the city’s newly discovered hot springs, and Banff soon became a destination resort. Its 250 rooms often filled to capacity with people seeking the health-giving steaming waters and fresh mountain air. Additions and renovations, most recently in 1999, have improved and enlarged the facility, which became part of the Fairmont chain in 2000. ﻿With all this in mind, we wandered through the lobby, admiring ample furniture, paintings, and heavenly oak beams in the public areas. We hopped on the elevator to search for the best place among four lounges and 12 restaurants where we could sit and enjoy the scenery—people and nature. We found that at the outdoor terrace, a peaceful setting with views among the best in Banff. Not onlydid we look out over river, mountains, and valley—a scene that’s hard to beat by itself—but the profusion of red, purple, pink, yellow, and white blooming flowers provided a colorful canvas of blossoms. Of course, the place was so large that we didn’t see it all, yet the ambience from staff was friendly and welcoming. The wine and complimentary snacks weren’t bad either. Today’s guest article by John Egan, managing editor of http://www.carinsurancequotes.com, a popular auto insurance website that provides online services to consumers, provides important tips for trouble-free road trips. Fall is a great time to travel, but even with cooler days on the horizon it's wise to be prepared for hotter-than-normal temperatures. That means more than just a wide-brimmed hat, plenty of sunscreen and a well-stocked cooler -- your car, truck or RV will need attention as well. Your battery powers your car when you turn the key, so without it you won't go anywhere. Hot temperatures can cause the electrolyte solution inside to evaporate. When levels get low, corrosion occurs and can ultimately cause the battery to fail. Check fluid levels by popping the cap on the battery's top and peeking inside. The solution should reach to just below the vent wells. If it's lower, add distilled water (but don't overfill to the top of the battery). 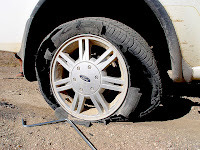 Tires take a beating in hot weather because of friction they endure against hot pavement for hours on end. When a tire is under-inflated, it flexes and adds resistance to its rotation. Keep a tire gauge in your car and check air pressure regularly. 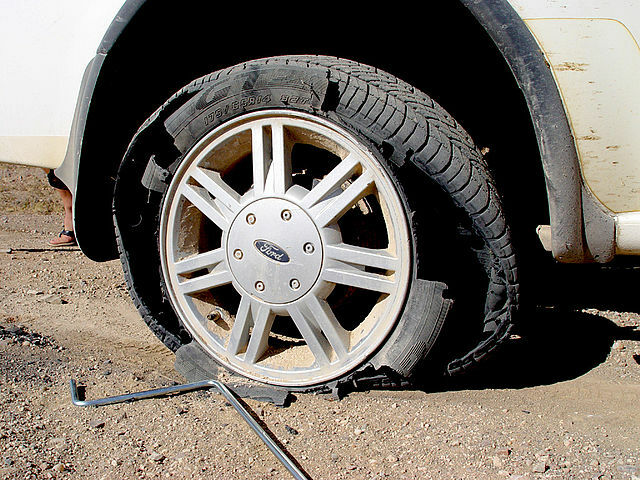 Having enough air in tires can prevent a dangerous blowout on the highway. The oil in your engine keeps all those moving metal parts lubricated and cool. When it gets low, the heat in your engine can increase by a fifth. Check oil at least every other gas stop. 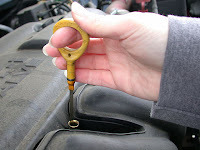 Pull the dipstick under the hood and make sure the level falls between the high and low mark. If you're low, simply pour half a quart in and check again. Repeat if necessary. Engine coolant is usually contained in a plastic reservoir under the hood with a clear mark for the fill line. If you're low, add more -- you can buy coolant at any gas station. The coolant absorbs heat, often reaching over 200 degrees before dissipating that through the radiator. If you drive a black or dark colored car, be even more diligent -- temperatures can be ten degrees hotter inside than in a white or light colored car. Heat can crack and split hoses carrying fluid and coolant between engine parts. When you check oil and coolant, look for leaking or cracked hoses. These are available at most auto parts stores, and employees will often help you with a hose swap. Finally, if your A/C system has a filter, be sure to change it annually. When it's clogged or dirty, it has to work harder to keep itself (and you) cool. Photos provided by Bankrate, Inc.
Banff in Alberta, Canada has been called a “cute” town and no wonder—it was designed to satisfy the expectations of tourists. That translates into a profusion of shops, restaurants, and hotels, especially in the south end. If you enjoy a lively social scene when vacationing there’s plenty to keep you occupied. These days Banff is also a bustling commercial center in the Canadian Rockies, not incorporated until 1990 when the emphasis changed from managing Banff National Park to serving needs of permanent residents. 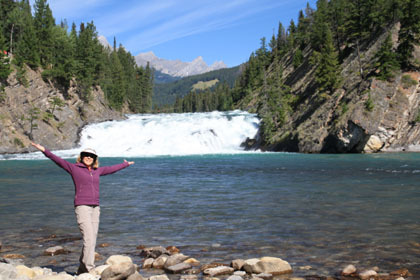 If you’re more interested in experiencing serene wilderness areas and some mild (or strenuous) physical challenges, you’ll find Banff a good hub from which to branch out and explore. We opted for light adventure and started our day with a hike to the Bow River. 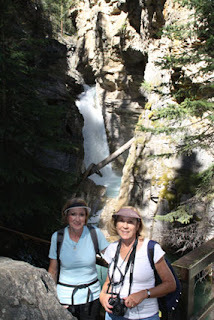 After parking at Surprise Corner, we scrambled down a grassy embankment and followed the rocky trail along the river to a point above Bow Falls. But then we wanted to see the cascading falls from the other side. 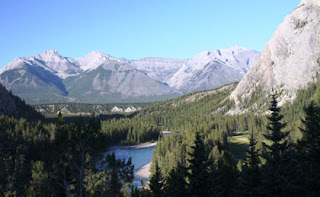 We stopped at a popular day-use area near Fairmont Banff Springs Hotel with excellent views, including a lookout point above the falls, which were formed as a result of glacier movement that caused natural dams eons ago. As we soon discovered, glaciers are responsible for almost all topography changes in this part of Canada. 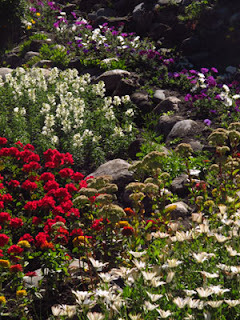 A visit to Cascade Gardens was surprisingly delightful--beautifully landscaped terraces with a multitude of blooming flowers, water features, pergola, and the most exquisite views looking back towards Banff Avenue and Cascade Mountain. The Garden is a wonderful place for a leisurely stroll or to just fill your senses with the beauty that nature has provided. Next we caught the four-person Banff Gondola for an eight-minute ride to the top of Sulphur Mountain. What a view, especially after walking up the boardwalked Vista Trail to a restored weather observatory. At an elevation of almost 7,500 feet, Sulphur Mountain provides stunning panoramic views of Banff, Bow Valley, Cascade Mountain, and Lake Minnewanka. Although wildlife is sometimes noted in the valley, we didn’t see any. Lunch was a picnic at Lake Minnewanka, otherwise known as Lake of the Water Spirit. 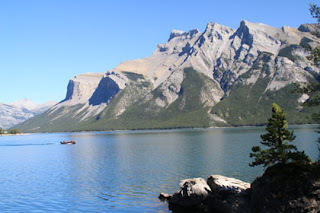 At 15 miles long and 466 feet deep it’s the largest lake in Banff National Park. The hydroelectric dam built in 1941 caused the lake level to rise 98 feet, which covered the town of Minnewanka Landing. A slightly uneven path leads around a good portion of the lake, so we walked along the trail and away from the crowds, admiring stony beaches, bright blue water and rock outcroppings that made excellent picture spots. An interpretive boat ride is available for those who want to learn more about the history, folklore, and geology of the area. As if one shimmering lake wasn’t enough, we continued our drive with quick stops at Two Jack Lake and Johnson Lake, popular spots for swimming, picnicking, or camping. On the return to Banff we saw our first wildlife, a tagged elk wandering near the road--a brief preview of the amazing wildlife sightings we would have later on this trip. Established as a tourist town from its inception, Banff in Alberta, Canada lives up to its reputation. The first stop for many people touring the Canadian Rockies, Banff came into existence when the Canadian Pacific Railroad determined that the natural beauty of the area would attract visitors if there was an easy means of transportation. That’s exactly what happened. 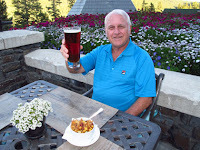 So, of course, we couldn’t miss this exhilarating mountain town on our tour of five national parks in Canada and Glacier National Park in Montana. Discovery of natural hot springs in 1883, which first attracted wealthy European visitors, was the catalyst for creating the national park--2,564 square miles of glorious mountain territory. Banff’s rich railroad heritage, including opening of the Fairmont Banff Springs Hotel in 1888, adds another dimension for history buffs. I’ll share more about our visit to the iconic hotel in a future post. The town’s first and main street, Banff Avenue, is oriented to offer incredible views of Cascade Mountain, a sentinel overlooking the town. We discovered there’s a vibrant community of artists and outdoor enthusiasts, and Banff has a plethora of hotels, restaurants, and shops within easy walking distance in the downtown area. 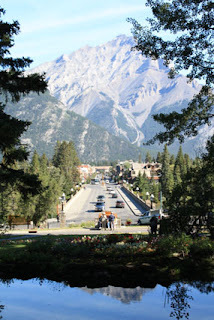 We arrived in Banff at dinner time after a long day of air travel and a 90-minute drive from Calgary. Following a recommendation from the attendant at Bumper’s Inn (we stayed in this mid-range hotel not far from downtown), we found Athena, a pizza restaurant that served hearty baked lasagna and spaghetti, too. Actually, there’s a good variety of restaurants in Banff that provide casual to fine dining. Some feature Canadian cuisine that includes locally sourced Alberta beef and bison, fine cheeses and wines. Revived with a tasty meal, we took advantage of extended day light to walk south along Banff Avenue to the Bow River Bridge, by the Park Administration Building, and caught quick glimpses of immacuately manicured Cascade Gardens. 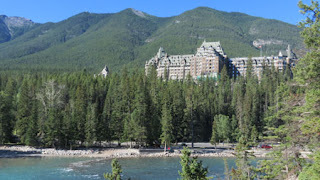 We drove just a few minutes to Surprise Corner, a beautiful spot with a view across the Bow River of the Banff Springs Hotel. Since it was a bit late for hiking, we decided to return in the morning for a downhill trek to the water’s edge and a better opportunity to explore the surrounding area. 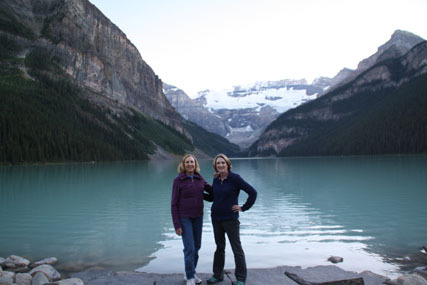 Read more travel stories by Beverly at Striped Pot and Austin Adventure Travel.